We are in the process of appointing an eight-person State Board in each of the 50 states. We welcome nominations from patriotic citizens such as yourself. -Dedicated to our mission of convincing the President of the United States to designate a state funeral for the last Medal of Honor holder from World War II. -Willing to build relationships with local media and suggest stories. -History of service in one more of the following types of activities: non-profit leadership, political campaigns, church boards, synagogue committees and other religious organizations, independent businesses and corporate boards. -Maintain open and responsive relationships with national headquarters. Please contact us at info@worldwar2salute.com if you are interested in applying or would like to refer a friend. 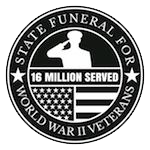 "State Funeral for World War II Veterans" is a registered 501(c)(3) non-profit organization. Donations are tax-deductible to the full extent of the law. Tax ID: 82-1730871. Sign the Petition Donate Join Us!